Yogic Breathing: Chest to Belly or Belly to Chest? There is an ongoing discussion in the yoga community about the directionality of the breath. There are many yoga breathing exercises and techniques, and students often ask: Do you begin your inhalation in the chest and then fill the belly or do your fill up the belly first and then expand the chest? This seemingly innocent question can have yoga teachers argue till they are blue in the face. Is there a right answer? Yep, but before we get to it, let’s start at the beginning. First of all, let’s get our facts straight: We cannot breathe into our bellies (if the air does go into your belly, you are in deep trouble). You certainly do and should expand your belly as you breathe in, but not because the air goes there. To understand the intricate process of respiration in yoga, we need to know two important facts. When the air rushes into the lungs, they get filled all at once. You cannot fill the bottom of the lungs first and then the top. Oxygen is not liquid; it’s gas. Therefore you cannot fill a container (lungs) from the bottom up, like you would with liquid. The degree of movement of the diaphragm and the ribcage in breathing can vary. During costal, or shallow breathing we rely mostly on the rib cage changing its shape. This is more common during higher activity levels or when the contents of the abdominal cavity restrict the movement of the diaphragm (for example, when there is a baby there). 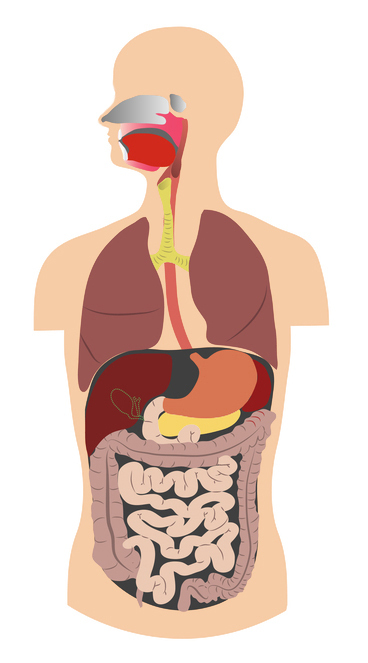 As you can see from this image, your abdominal cavity is packed with stuff—vital organs, digestive tract, etc. When the diaphragm moves down on the inhalation, it pushes down on your abdominal content and it has no other place to go but forward, so your belly pushes forward. 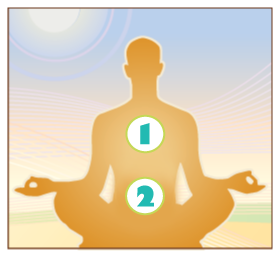 So far we have described the natural pattern of breath: when you breathe in, your chest and your belly both expand at the same time; when you breathe out, both of them return back to the original shape. Now, we can use muscular control to change that pattern, consciously or unconsciously. One of the examples of unconscious muscular interference is an unfortunate pattern of “reverse breathing,” when we pull the belly in on the inhale, instead of pushing it out. Your exhalation can either be passive or active. With passive exhalation, the muscles that have been contracting on the inhalation relax and return to their original position. With active exhalation you use your abdominal muscles to compress the abdomen and force the diaphragm upward. If you do your abdominal contraction in a gradual fashion as you exhale, it will help stabilize and support your lower back. Most importantly, yogis were very interested in the energetic effects of the breath. Breath is a vehicle for Prana, the vital force that runs in different currents throughout the body. According to Bhagavad Gita, every breath cycle is an opportunity to link Prana vayu and Apana vayu, two primary currents of the life force. Apana vayu, which is aligned with the force of gravity, moves downward resulting in elimination of wastes, as well as disease, aging, death and the diminution of consciousness. Prana vayu, which is aligned with the air and space elements, is meant to move downward and is responsible for everything we take into the body—food, water, experiences and information. But Apana vayu can disperse upward through the mind and senses, especially in this age of sensory and information overload. This leads to devitalization and loss of mind-body coordination. Uniting the two primary vayus results in strengthening our energy along with awakening our higher faculties. 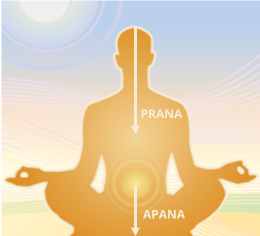 Yogic practices work to raise Apana vayu up to unite with Prana vayu and draw Prana vayu down to unite with Apana vayu, which occurs in the region of the navel, the pranic center in the body. So to go back to our original question. What is the proper yogic breathing technique—chest to belly or belly to chest? The answer is: It depends! It depends on what you are trying to accomplish in your yoga practice. Also from YogaUOnline and Olga Kabel: 4 Types of Yoga Poses to Increase Axial Extension. Study with Olga Kabel: Avoiding Yoga Injuries-Common Alignment Mistakes in Forward Bends and Twists. Study with YogaUOnline and Robin Rothenberg -The Healing Power of Breath: Essential Techniques for Healthy Living. This article originally published on Sequence Wiz. Reprinted with permission.